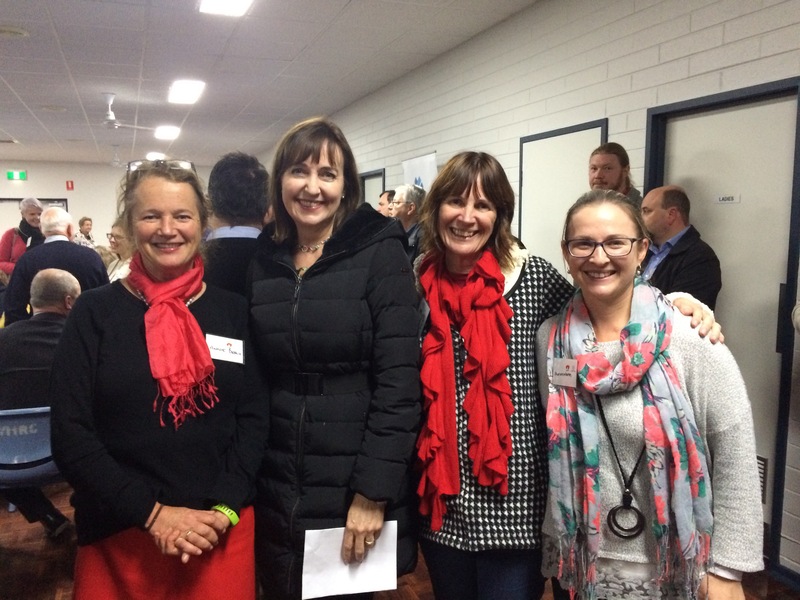 Meeting our State Education Minister – Susan Close! I have just returned home after a very exciting meeting and half an hour later, I am still grinning like a Cheshire Cat. I am on such a high that I want to share it with you!! 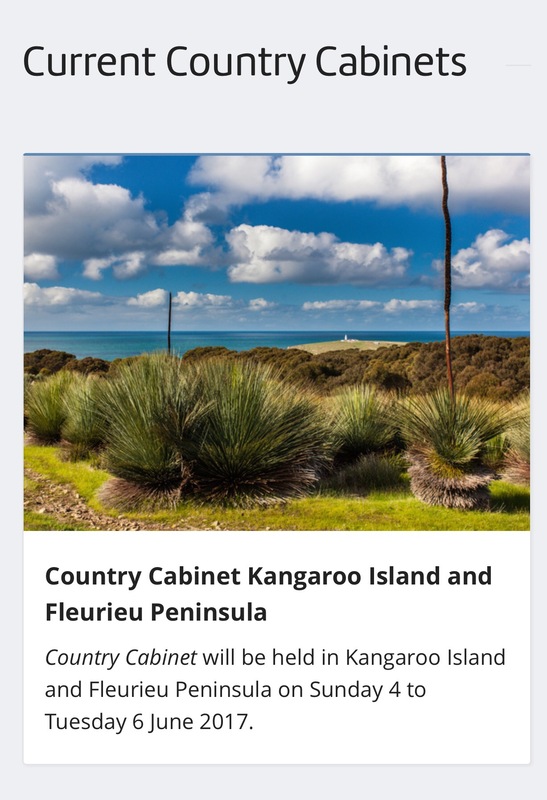 Last Friday, Annie added our 3 names to the invitation list of the Country Cabinet State Government visit to the Fleurieu. The aim of the Country Cabinet visits is to provide regional residents with a community forum so they can speak directly to the premier and his ministers about issues directly relevant to their region. We were thrilled that this would provide us with an opportunity to speak with the SA education minister, Susan Close. Last year we heard her speak at the MLTASA conference about the importance of language learning. All the language teachers were delighted to discover that we had such a powerful ally in our state government. During our car trip home after the conference, we decided that it was a priority to speak directly to the minister about TPRS but could not find a time that suited us all. It was a gift to hear that she was visiting our region and schools this week. Tonight the 3 of us joined the throng at the Victor Rec Centre enjoying a BBQ dinner cooked by the brilliant Lions Club. It was lovely seeing such a huge cross section of people representing the Fleurieu. We caught up with friends while munching on sausage sandwiches (or in my case, a veggie patty) while waiting for the cabinet to arrive. We had deliberately chosen seats at the back of the room to give us an excellent vantage point from which to peruse all who entered. Annie immediately spotted Susan Close as she arrived. We allowed her time to grab a sausage sandwich before making a beeline for her and totally monopolising her until she had to make her way to the front. Susan was very gracious and listened intently to us as we explained to her about TPRS and all that we have achieved down here on the Fleurieu for language teachers. She asked many questions (when she could get a word in!) and was delighted to hear that she will get the opportunity to observe TPRS in the classroom tomorrow during her school visit. It was so exciting to have the opportunity to speak directly to the minister of education about TPRS, a largely unfamiliar methodology in Australia, that has the potential to reverse the decreasing numbers of students choosing to study languages across secondary and tertiary sectors in Australia. We took great delight in sharing Ian Perry’s amazing 2016 student retention numbers as evidence of this!! Let’s hope our chat and the brief observation opportunity tomorrow will tweak her curiosity enough to investigate TPRS further. It would be awesome to have her support!! After writing the post about the South Australian Education Minister’s visit to my Indonesian language classroom, I sent both the minister, Susan Close, and the Premier, Jay Weatherill, a link to the post. Last month we received the following email from the DECD Chief Executive, Rick Persse, in a reply on behalf of Jay Weatherill. Isn’t it wonderful that as a direct result of us attending the Country Cabinet, all levels of DECD are now familiar with TPRS pedagogy! How exciting is that? We decided to concentrate on his concern that TPRS does not completely address the intercultural understanding aspect of the Understanding strand within the Australian Curriculum: Indonesian. We began by taking up his offer to contact Maribel Coffey, which we did both by phone and email. She promptly replied to our email with a kind offer to put us in contact with Gianna DeLeo and Rosa Garcia, 2 Languages Project Officers from her team. Gianna and Rosa readily agreed to come out and spend a day with us to help us identify the intercultural learning gaps we may have and then provide practical strategies that will help us improve our teaching practise in this regard. In preparation for their visit, both Gianna and Rosa researched TPRS which we truly appreciated. They were familiar with Stephen Krashen; every TCI teacher’s hero. Having an understanding of Krashen’s hypotheses and TCI meant that Gianna & Rosa could focus specifically on intercultural understanding in a TCI context without needing a TCI 101 along the way. We arranged that Gianna & Rosa would visit us each in turn to observe us teaching a lesson, finishing up at Victor R-7 where we would all gather to discuss their observations and feedback. For my lesson, I demonstrated ‘Kursi Luar Biasa’ (KLB) – largely because Annie & Sharon encouraged me to do so – but also because it is one of the most engaging ways I know to cover many of the curriculum content descriptors. Because KLB involves asking students personal questions, it provides students with a platform to talk about themselves, either truthfully or not! I actually prefer it when students lie (suggest bizarre answers) because it ramps up the engagement a hundred percent and makes it totally compelling! Overall I was satisfied with the way in which I demonstrated how I incorporate intercultural understandings into my teaching. For example, the snake and dog pic in the above slide are included because they are 2 animals most of our Indonesian visitors have been significantly frightened of! After the last lesson, I packed up my room quickly and raced over to Victor R-7 where everyone was already waiting for the conversation to begin. Firstly Gianna & Rosa began by stating how impressed they are with the teaching that they had observed in our classrooms. They used adjectives like ‘exemplary’!! They both too commented on the high levels of student engagement in our rooms and the large amount of spontaneous Indonesian spoken by our students in class! We then began to deconstruct ‘intercultural understanding’ using examples that Rosa & Gianna had observed in our classrooms throughout the day. They firstly congratulated us on how well we already integrate intercultural understanding into our TCI lessons and then offered us advice on an additional aspect that if incorporated, would elevate our practise to an even higher level. Rosa handed us each a copy of the Investigating Pedagogies for Language-and-Culture Learning (see link below) which aims to outline the relationship between the TeFL Framework, ACARA: Languages & The Shape document and “in doing so highlights the intercultural orientation to language learning” (page 1). This paper outlines the characteristics of language learning incorporating Intercultural Understanding – referred throughout as intercultural orientation. Intercultural language learning is an orientation to language learning that represents a change in both the stance (the way we conceptualise language learning and the thinking that informs practice) and practice in the teaching and learning of languages and the pedagogy that supports such a change.  understands learning, teaching and pedagogy to support language learning as including processes of inquiry for both learners and teachers.This intercultural orientation shapes the three key concepts that inform Languages education: language, culture, learning, and focuses on developing capabilities that are essential in the 21st century. The specific skill that Rosa & Gianna recommend we hone centres around providing students with opportunities for intercultural and intracultural reflection. Rather than providing explanations to students about differing cultural practises, throw it back at the students and encourage them to consider the reasons themselves. An example of this could be around Indonesian etiquette which requires objects to be received and passed with your right hand, never your left hand. My students have often commented on this and previously I simply explained the reasons. Rosa recommends that instead, teachers could ask deeper questions to encourage students to look beyond the difference and instead consider it objectively and rationally. Questions could include asking why Singaporeans use their left and right hands but Indonesians don’t. Is this practise practical and when would it be sensible in Australia? Is the use of toilet paper or water better for the environment? Why do Australians use a water based toilet system when we are the driest continent in the world? In other words, asking rich and thought provoking questions that encourage students to develop self awareness and self understanding through honest reflections around not only the comparisons between different cultures but also the differences within cultures.  our judgments in relation to those of others. This kind of reflection is a necessary part of stretching students’ intellectual thinking and of ‘fostering deep understanding’ and exploring the construction of knowledge (3.2 and 3.3 of Domain 3 of the TfEL Framework). Rosa explained too about flipping information to help students look at a cultural practise from another perspective. The example she gave was the western tradition of birthday cakes. Imagine a culture that puts fire on decorated food and then gives it to a child who then has to extinguish the fire by putting it out themselves by blowing on it before it can be eaten by anyone! Sounds quite bizarre when stated like that! We were assured that these classroom conversations do not necessarily need to be long and detailed but more like a grammar pop-up and in doing so would become an engaging brain break. I really like the idea of prompting students with ‘why’ questions to encourage them to consider the reasons underlying different cultural practises. It truly resonates with me and I look forward to impromptu opportunities whereby I can ask deep and meaningful questions to encourage rich reflective and reflexive student thought. It is definitely an expertise I intend to develop! Surely this is how schools create open minded and respectful global citizens. Thank you so much Maribel Coffey, Rosa Garcia & Gianna DeLeo. We really appreciate the support and encouragement we received from you all. Rosa and Gianna are both wonderful ambassadors of the Languages team. The entire experience was invaluable and we are so grateful that both Rosa & Gianna could spend time with us to work on addressing intercultural understanding in a TPRS classroom context. The conversations we had were thought provoking because developing cultural respect and empathy in students is of a critical importance in relation to global relationships. We are all excited to implement the advice given to us and develop our expertise in asking reflective questions. We also really hope that early next term, Rosa & Gianna can visit us again to provide us with feedback on our updated practise and understandings to double check we are on the right path. We will also be scrutinising our school calendars to ascertain when our next Partnership Closure day is before inviting Rosa to again share her impressive expertise about intercultural understanding with the Fleurieu TCI PLN. What has Changed In My Classroom Since Agen? Anne asked me this morning this question! It’s a good one because so much has changed as a result of my week in Agen and yet it is hard to pinpoint exactly. Spending a week in Daniel’s Breton class is one of the major reasons why I’ve adapted various changes into my teaching. Becoming a learner of a language as a beginner is something I urge all language teachers to try because if you are like me, I can’t remember what it was like anymore. Experiencing the importance of repetitions and needing EVERY. SINGLE. ONE. I no longer begrudge saying words over and over again anymore. I am no longer concerned about a repetition being boring. I know that each and every time I speak, there is someone in my room who needs to hear that word once again. One more change I am working on is speaking slowly. I am now even more aware of the importance of this. While I really like Robbert Harrell’s tip of tapping slowly on your leg, like a metronome, I have yet to try it in class. One day, I’ll remember! As a learner, I really needed Daniel’s slow pace. It was vital for comprehension, it kept the affective filter low and also gave me enough time to scan the word wall when necessary. While on the topic of slow, I also would like to mention how Daniel would occasionally challenge the fast processors by speaking directly to them at a slightly faster pace and then turn to us slower processors and repeat it slowly! Repetition followed by slow! We lapped it up! Daniel would ask students for suggestions while story asking and each one was written up on the board if necessary. This practise differentiated and valued each and every suggestion. My suggestion of a kangaroo was a cognate and did not ever need to be written up on the board but dianvasou (stranger) definitely went up! I now do this too! Through this practise, I can point and pause which is a useful tool that helps to slow my speech down! Previously, in avoiding going out of bounds, I avoided incorporating new words into our story asking/ kursi luar biasa, but now I embrace it and have started collecting words that appear frequently and/or are useful for student engagement and would be great to incorporate into future stories! Probably the biggest area of change is that I am incredibly more relaxed about my lessons. After watching Daniel, I have more confidence now following student led directions in lessons. With my older classes, since my return, I now spend each lesson focused on kursi luar biasa. One student sits in the kursi luar biasa (the awesome chair) and I interview them. I make it clear before we start that the student may choose to tell the truth or lie! As soon as that is established, you can feel the ripple in the air of engagement and immediately the rest of the class are on board. We start off with nicknames. I ask the student seated in the kursi luar biasa if he/she has a nick name and then ask the class what they are, checking after each if it is one of their nicknames. It’s hilarious! One class came up with 12 nicknames for Shaun – one of which was Sunday! It was so left field we all collapsed on the floor laughing! It is so exhilarating teaching like this! We incorporate all sorts of things into the interviews including grammar, pronunciation, intercultural comparisons (ACARA requirements) – it is awesome. Once I’ve done a few more, I am going to create a reading using the sekretaris notes and maybe incorporate one of Laurie Clarq’s embedded reading ideas and finish with an uplifting clip from youtube. Cool hey? Another thing that has changed for me is that in meeting such an amazing bunch of people, I know there are many people in this world who have my back. It is the most amazing feeling being in and amongst CI/TPRS colleagues and feeling that sense of support and community. I definitely felt it with our PLC and online before Agen, but to feel it in another country was truly incredible. Knowing that I am a member of such a warm global community gives me the confidence that supports me each and every day before I step into my classroom! When you are amongst TCI legends who validate and encourage, you feel invincible. This is what gives me the confidence to incorporate all of the above into my teaching. Usually in Kursi Luar Biasa, (literally – the amazing chair [special student interviews]), I ask students personal questions about themselves (age, likes, pets etc) followed by a quiz. The quiz is a benar/salah style quiz. I began at first by asking students to stand if the statement I said about the ‘amazing student’ was true or sit if it was false, however I soon discovered that this became a sheep following exercise; if one stood/ sat then the majority followed suit without any thought. So the quiz became, stand if it is true for you and sit if it is false for you – as this requires greater focused listening & personal accountability. So if I say, ‘Susan tinggal di Victor Harbor’ (repeating one fact that Susan had told us about herself), the students who also live in Victor, stand. If I say, ‘Susan tidak tinggal di Mount Compass’, then all the students who don’t live in Mount Compass would stand, while those who do, sit! As Kursi Luar Biasa (KLB) is largely a short one on one conversation with just the occasional questions addressing or about other students (to ensure comprehensibility and/or to encourage listening), engagement levels from the older students have decreased noticeably this semester. I have racked my brain for ways to ramp it up. I scoured Bryce Hedstrom’s Persona Especial posts for suggestions appropriate for this age level as well as being suitable for Bahasa Indonesia (the Indonesian language) and tried those that had potential (see past posts) but there were still students using this session as a zone out time. As they are generally quiet, I’ve accepted it because it has allowed me to focus on the ‘awesome’ person and to keep the spotlight right on the student who chose to sit in the chair! I also justify it to myself with the thought that while they are not listening with the intent to understand, they are still being exposed to Indonesian. Yesterday, a year 7 boy, J, changed all that! He had us all following closely his hilarious answers and the entire class was 100% engaged and following the discussion closely! After The interview had finished (stopped by the recess bell), I asked the class for a rating out of 5 (using their fingers) and 98% rated it 5/5 while 2-3 rated it 4/5. I got exactly the same score for overall comprehension of the entire conversation! J began by telling us where he lived and about the people in his family (great opportunity to revise one of the new target structures from the story that lesson) and then when I asked him about the sport he plays, we learned that he plays centre forward for Goolwa Hockey Club and is the leading goal scorer (dua juta gol!). A student who actually does play for Goolwa, was shaking her head and making it clear with body language that J does NOT play hockey for Goolwa!! He started wildly embellishing (when asked what team he plays in, he stated the under 18’s – a grade that doesn’t exist in our local association), he had everyone’s attention. We also learned that he plays in the AFL for Port Power and after pulang sekolah (another target structure from the earlier story – go home from school), he eats and then goes to Adelaide to train! He also claimed that he was a talented surfer, almost as good as Mal (a fellow student who is an extremely talented surfer and has participated at the national level). This last claim had his friends rolling on the floor with laughter!! He also made ridiculous claims about playing in the NBL! It was the most enjoyable KLB interview I’ve had in a long time and one I encouraged the students in that class try again! Previously, I have discouraged students from stating fictitious information about themselves because I’ve always considered this part of the lesson as an awesome way for me to get to know my students better. However, my brain is generally on overload and I am finding, I’m embarrassed to admit, that unless a student tells me something really unusual or moving, my back to back lessons all merge into a vague hodgepopdge and I forget who said what. Yet I still see a value in beginning this way, especially with the middle primary year levels. It is a safe way in which to support students with repetitions of the vocabulary and language structures needed to answer personal questions or to talk about themselves to others. It provides them with a solid foundation upon which, when they are older, they can start being creative and quirky!! I am so looking forward to next week when I can encourage the other year 67 classes to be wild and wacky.